HomeReDoerShan I used this product to repair a 3/4"x5' "line" on the drywall where an old bathroom cabinet had been for 30 yrs. The original wall texture looked to be similar to the heavy or coarse setting on the Homax can. I had concerns in regards to the Homax spray showing up more than the damage as the damaged area was narrow and long. My concerns were unfounded. I watched the online demo, had no problems with the tab breaking and practiced a few sprays on cardboard. The spray came out beautiful! I found the perfect setting and once painted it will be practically impossible to see. Took me about 5 minutes and the results were awesome. I think practicing the distance you are spraying at and cleaning off the nozzle frequently helped with the results. Thank you. Hops Used this product for the 1st time. Although the first can had the spray nozzle fall apart while try to change the spray thickness, the 2nd bottle worked great and blended with the other texture perfectly. I can't detect the new drywall versus the old at all. Definitely easier than buying a hopper and dealing with all of that. Dan It did exactly what it professed to do. I tore out a wall and patched the adjoining wall. I am very pleased with the product. I did however, have to give it two coats but that was probably because I used it sparingly the first time as to not get to heavy of a coat. TejasTransplant Bought at Home Depot on recommendation from the salesperson. 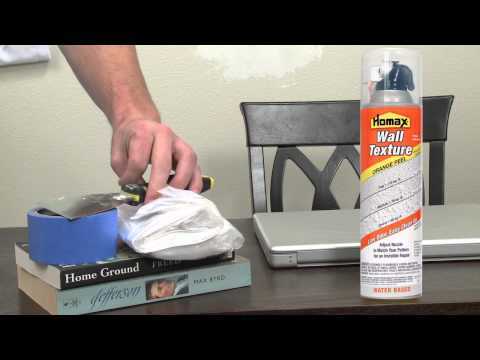 Watched product video on Homax.com website and it looked easy to apply. Thankfully decided to try it out first on a cardboard box for a "test run" Test Run: As mentioned by the other reviewer, the nozzle broke off while I was removing the white safety seal. But I was able to reinsert it just fine. The product did not come out blue (as advertised) but came out white. Dried in approx 10 minutes. However, it looks like paint splatter... definitely NOT three-dimensional texture. Tried varying the tip from "fine" (which looks like spray paint) to "heavy" (which looks like gloppy spray paint). The product does not have any texture to it after a single application. So I tried doing a second application on top, but it doesn't give it any three-dimensional texture look. The result looks like paint splatter... NOT texture. I'm returning it to Home Depot and I will not use this on my wall. TejasNative Removing the tab per instruction, the nozzle fell out breaking apart. After reinstalling the nozzle and spray the wall, the spray went everywhere requiring cleanup. The wall looks terrible. Homax Orange Peel Water-Based Wall Texture is a low-odor, water-based formulation of our most popular “orange peel” and splatter texture for textured drywall repair. Variations in orange peel texture (also called splatter or eggshell) help hide surface imperfections, while reflecting light and adding interest to a room. Our water-based formula excels at replicating orange peel texture patterns so you can get professional results fast. Great for patching and texturing small rooms and accent walls. Low-odor water-based formulation of our most popular “orange peel” and splatter texture. Matches a wide range of texture patterns with the advantage of easy water cleanup and very little odor. This fast-drying spray texture is a great choice for patching in occupied spaces like offices, schools, hospitals, etc. • Covers up to 50 sq. ft.
Homax Orange Peel Water Based Texture is the fastest way to patch “orange peel” drywall textures. To achieve the best results, please read the following directions carefully before you begin your wall repair project.